Olan Recipe – mildly spiced dish cooked in coconut milk. Olan is a traditional and authentic Kerala recipe and is very easy to prepare. Olan is made with coconut milk and ash gourd as the main ingredients. 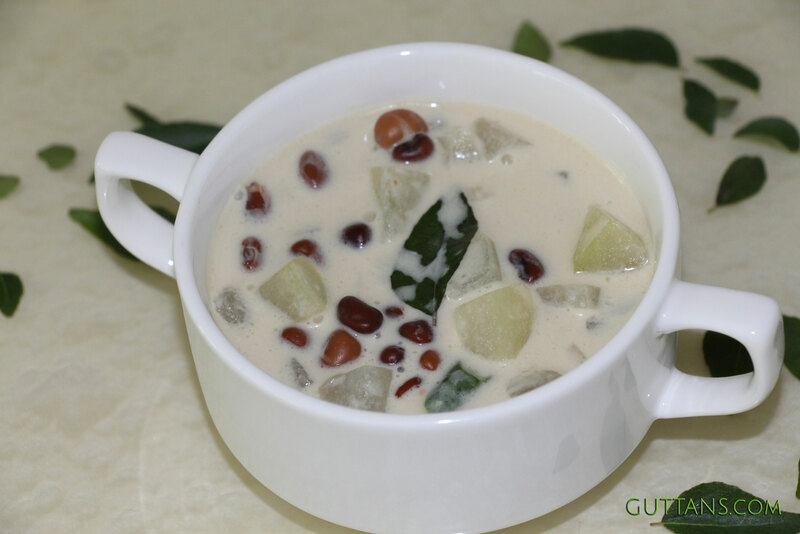 Ash gourd stew is one of the important dishes in Kerala Sadya (feast). Kerala Olan – a special onam sadya and vishu sadya recipe made with healthy olan beans (cowpeas) adds more taste to this simple dish. Olan curry can also be made with black-eyed peas instead of pink cowpeas (van payar). While making olan, there is no need to pre-soak the beans before cooking. Make sure that the olan beans are not over cooked. It should retain its shape. Pressure cook ½ cup olan beans with enough water. After the first whistle, simmer and cook the beans for another 2-3 minutes in low flame. Wait until all steam has escaped. Once the pressure settles, open the lid. Drain the water from the beans and soak the cooked beans in warm water for a while. This is to keep the olan stew curry colour white. Otherwise, the brown colour from the cow peas will make the stew brownish. Again strain the beans and keep aside. Olan beans should not be over cooked, it should hold its shape. In a pan, add ash gourd, little water and salt and cook in low flame till ash gourd becomes tender. Check and make sure that ash gourd is not over cooked or mashed. Add thin coconut milk, cooked beans and green chillies and mix well and cook for 3-4 minutes. Add thick coconut milk and cook for another 2-3 minutes and remove from fire. Season with coconut oil and curry leaves. The curry tends to thicken as it rests. Mix well and let it stand for 30 minutes before serving. The curry has a thick consistency. OLAN QUANTITY : ½ cup dry olan beans = 1 cup cooked beans. MEASURING TOOLS USED : 240 ml cup, 15 ml tablespoon and 5 ml teaspoon.